Today is ONE WEEK from our wedding day!! Squee!!! Is it weird that I practice writing my new last name already? You know, like we did back in school when we had a crush on a boy? Wait…was that just me? Forget I said anything. So, how ’bout this tuna sammich?? I know many people have an aversion or dislike for canned tuna. I’m not one of them. In fact, tuna fish has been one of my favorite things to eat since I was a kid. Mix it up with some miracle whip, pickle relish or chopped dill pickles, a squirt of yellow mustard, salt and pepper and eat it up. With crackers or on toasted bread. Or, when I was at my Grannie and Grandpa’s house, I’d just eat it with a spoon out of a metal bowl. Yuuup. I’m all classy and sophisticated like that. I will have to say though, that this version is definitely more grown up. I mean…curry?? Yep. Granny Smith apples and yellow curry powder for. the. win. 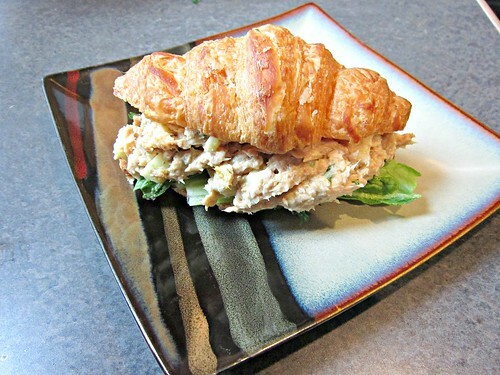 J and I both really enjoyed this tuna salad on croissants. It has a lot of good flavor, and definitely won’t leave you feeling like you just ate canned tuna fish. And it’s so quick and simple to make, you can have lunch on the table in less than 10 minutes!! Today is as good a day as any, don’t ya think?? Open the cans of tuna and drain the water from them. 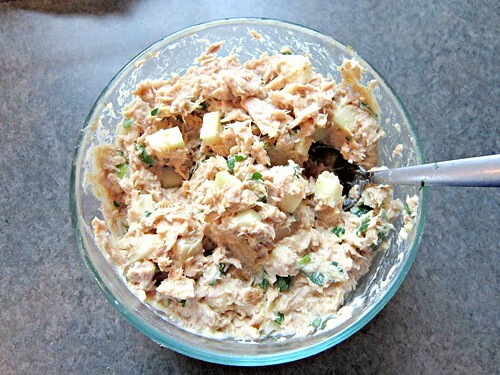 Place into a large bowl and add the diced apples, parsley, 1/4 cup Miracle Whip or Mayo, curry powder, salt and pepper. Mix well and add more miracle whip or mayo to your liking. Cut croissants in half length-wise (toast them if you like,) place a lettuce leaf on the bottom half, top with a generous portion of the tuna salad, and then the top half of the croissant. Dig in!